I’ve been eating paneer butter masala or paneer makhani for as long as I can remember. It’s one of those classic Indian dishes, you are bound to see it at weddings, as part of a buffet, at parties, on restaurant menus both big and small….they may not call it paneer butter masala verbatim, but it’ll be there. It’s rich, it’s creamy, it’s a little sweet and it’s pink and pretty…perfect with naan, roti or phulkas. When we have had guests over for dinner, with a few vegetarians, I would always order it in from my favourite restaurant- I mean, how could I possibly make something that complicated, right? A regular paneer bhurji or stir fry I could do; but everyone knows what good paneer butter masala tastes like, and it wouldn’t be right if mine bombed. But turns out that creamy, pinkish, fragrant paneer butter masala is just as easily made at home, and it doesn’t take that much time, too much effort, or a yard-long list of ingredients! I found this recipe on the hugely popular vegetarian food blog, Edible Garden by Nags, and it’s so simple and so delicious I have made it over and over again. And now that we are into the fall season and colder climes are setting in in many parts, this would be a nice warm dish to enjoy on a cold night. And even though I don’t have much of a nip in the air or the need for scarves and transitional fall clothing to keep myself warm in Mumbai, I will gladly serve up some of this for dinner. But yes, it can be too heavy during the summer months, given that it contains cottage cheese, butter and cream- so we might as well enjoy it now. 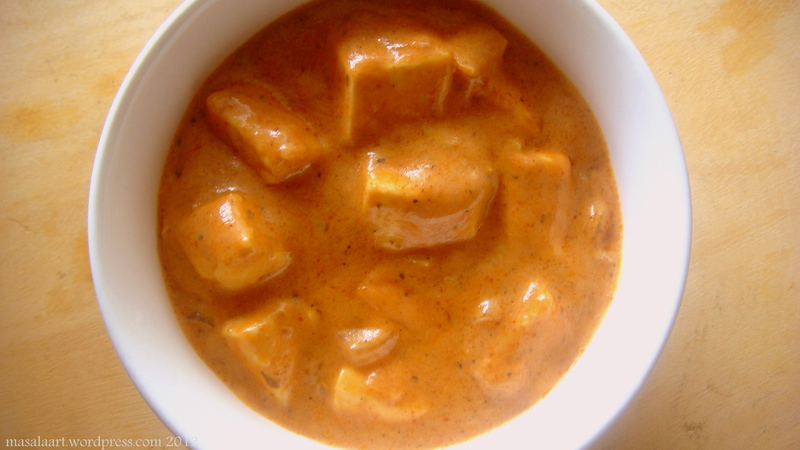 PANEER BUTTER MASALA: Find the recipe here, at Nags’ blog. I followed it as is. Can’t go wrong! 3. It is something that will go down well with most diners, barring vegans and those with dietary restrictions. Even picky eaters will find some comfort in something as familiar as this. And, even the wily food snob, who turns his nose down at cult classics like ‘Gobi manchurian,’ ‘Chicken 65,’ and paneer butter masala, will still partake of it. « Chocolate Almond Pound Cake: I Found My Favourite Chocolate Cake Recipe! Paneer is so delicious…love this classic dish! The pictures are great too. Hope you are having a great weekend my friend! This reply comes soooper late- but thank you, Ameena! Haha! Yeah it’s the best paneer butter masala recipe there is, and doesn’t call for too many ingredients. But I completely understand the guilt pangs- all the cream and paneer make it taste wonderful, but needs to be consumed in moderation! Wow. This looks simply delicious.